Receivables Management Partners is privately held with headquarters in Greensburg, IN. With 9 locations, RMP has over 520 dedicated employees serving roughly 200 hospitals and over 30,000 physicians across the country. With over 350 years of cumulative operating experience, RMP continues to invest in the future with a goal of significant growth through successful client partnerships. RMP is a leader in healthcare revenue cycle management nationwide and growing rapidly, both organically and through acquisition. However, while the business grew rapidly, the brand and website failed to represent the strengths that RMP brought to acquired companies that became a part of the RMP family. 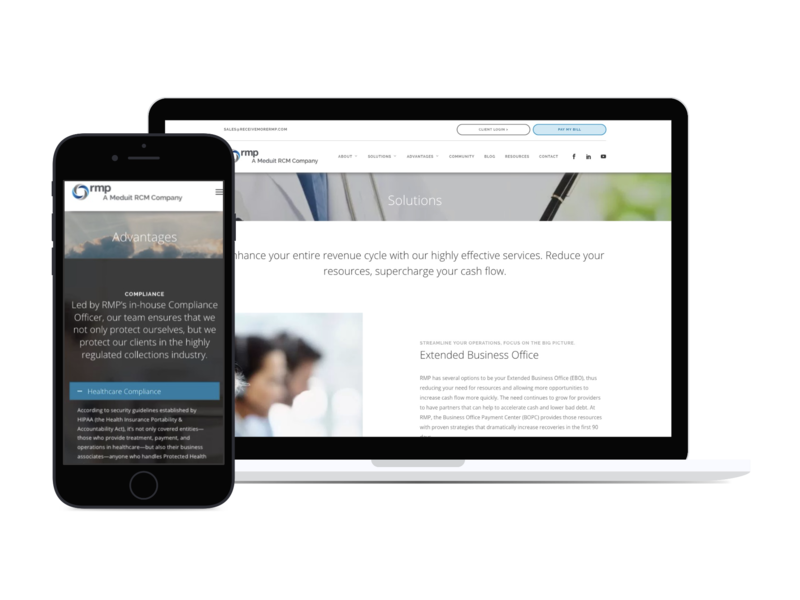 Absolute streamlined the website with a fresh, modern look that resonated with its healthcare clients. Acquired companies are now referenced as locations instead of their original brand names, reducing brand confusion for RMP clients and prospects. Throughout the site, clear calls to actions highlight the strengths of the combined company, and has greatly enhanced sales and revenue. Social media accounts are also now highlighted and a blog is regularly updated with relevant industry content.